OxiClear Review What's great about OxiClear, is how fast it works. It's ability to work so quickly is through a powerful oxidation reaction that occurs when OxiClear comes in direct contact with the algae. Here at webbsonline, we carry a variety of our own labeled treatments. Our most popular being OxiClear. 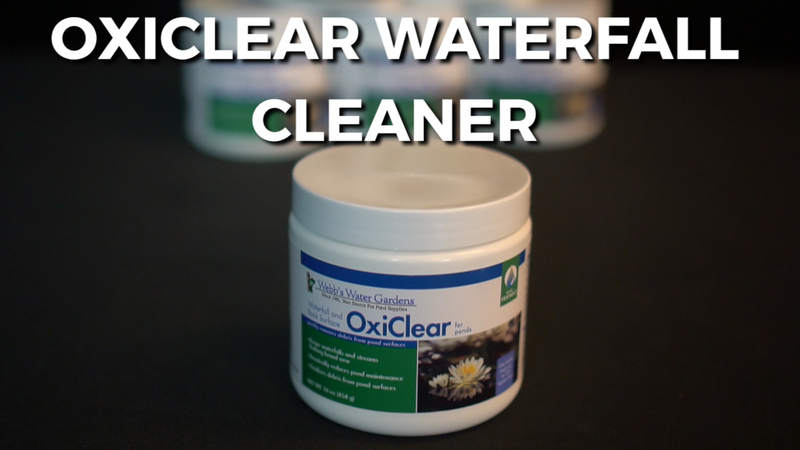 OxiClear is a contact algaecide that is applied directly onto algae infested areas. What’s great about OxiClear, is how fast it works. It’s ability to work so quickly is through a powerful oxidation reaction that occurs when OxiClear comes in direct contact with the algae. An added benefit of this reaction is that it also adds oxygen back into the pond. To apply, simply sprinkle the OxiClear on the stones at the prescribed rate. If treating in a waterfall you’ll want to first turn off the pump before applying. Wait about 20 minutes before turning them back on. OxiClear can be used in features containing fish and plants. It has no temperature restrictions and works great wherever algae grows – waterfalls and streams, the edges of the pond, and even on fountains. OxiClear can be used in features containing fish and plants. It has no temperature restrictions and works great wherever algae grows – waterfalls and streams, the edges of the pond, and even on fountains. For additional information on OxiClear or any other Webb’s treatment, please give me a call. I’m Joe from webbsonline.